Discipline was never my favorite word. Whenever I used to hear the word discipline, I would cringe. When I was a kid, discipline meant losing something, not being able to do what I wanted. As an adult, discipline is one of my key hunts, a target that is always in focus. Discipline now means I can have EVERYTHING I want. Discipline is not deprivation; it is being conscious of choices and being aware of how they impact the goals you set in your life. Doing what you have to do so you can do what you want to do. As a parent, I find myself in a constant state of saying that phrase…you have to eat your vegetables so you can have ice cream…you have to put your shoes on so we can go out and play. For adults, the return on acceptance is greater. The small annoyances (vegetables) are nothing compared to the trophies (ice cream) you can achieve. The trail you need to follow from point A to point B is more complicated and the first step is so much easier when you accept it’s what you must do. Choosing acceptance is easy. Overcoming your feelings/emotions about a task and getting it done. I can truly say I very rarely “feel” like tweaking a business proposal for a third or fourth time. Does this mean it’s not necessary? No. Does it need to get done? Yes. While it’s not the thing that gets me out of bed in the morning, I know that my feelings have nothing to do with it. It is will that gets you out the door and in the hunt. Never underestimate the power of will. It is what allows you to target a specific buck, climb Mt. Everest or make the impossible possible. Plugging away; crossing t’s and dotting i’s, solving problems, getting to the core, staying in it until it’s right. When your heads-down and in your hunt, persistence is the fuel that keeps you focused on the prize. Now you can see the light at the end of the tunnel. You can taste the freedom your discipline has brought you. Some final questions: are the choices you’re making the best for you and your life? And if discipline is just a series of choices, can we consciously make our lives better by choosing to, say, get up 15 minutes earlier to exercise, not because we feel like it, but because the end result takes us closer to a coveted target? When you find clarity about your goals, discipline will be a key weapon you use to take down the targets that mean the most to you. 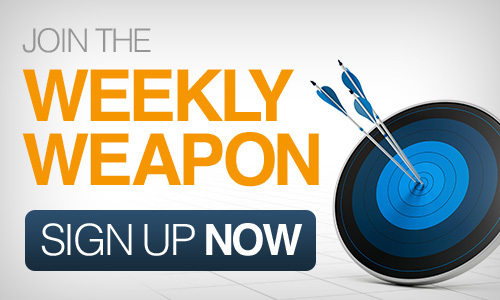 This entry was posted in Your Weekly Weapon With David Farbman on May 16, 2014 by David.